FOR EVERYONE: Please confirm your attendance at the next Power Soccer event here! 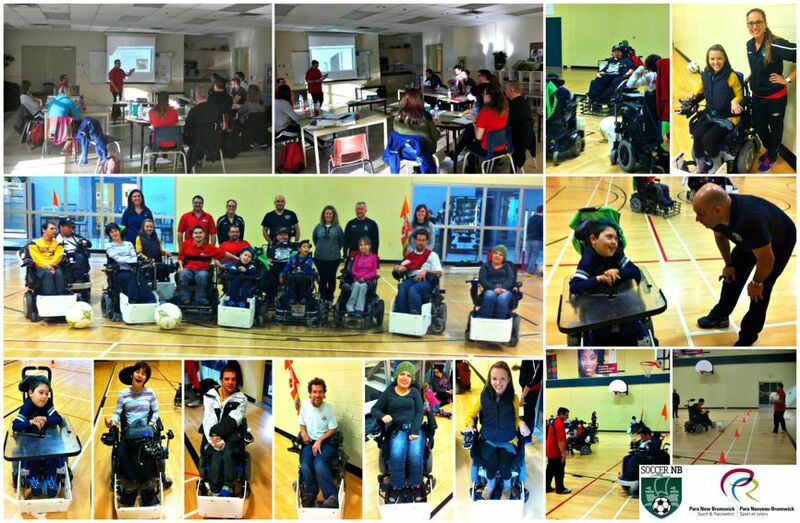 Soccer New-Brunswick, Para New-Brunswick and the East Region Soccer Association teamed up to bring Powerchair Football to Moncton in the Fall of 2014. Volunteers are currently needed once a month on event days to support powerchair users as they try this new and exciting sports activity. Sport improves the quality of life. This sport provide meaningful exercise opportunities that can improve fitness, wheelchair mobility, and enhance executive processing skills needed for everyday function. Support individuals who use powerchairs from our community. Support the development of a new experience for Powerchair users in New-Brunswick that promotes quality of life, team work, community, and fitness. Greeting and providing information to athletes and volunteers. Setting up training and game area. Mounting and removing brackets and bumpers athlete’s chairs. Assisting and encouraging powerchair athletes as they learn this new sport. Collect information for athlete’s profile.